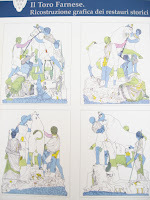 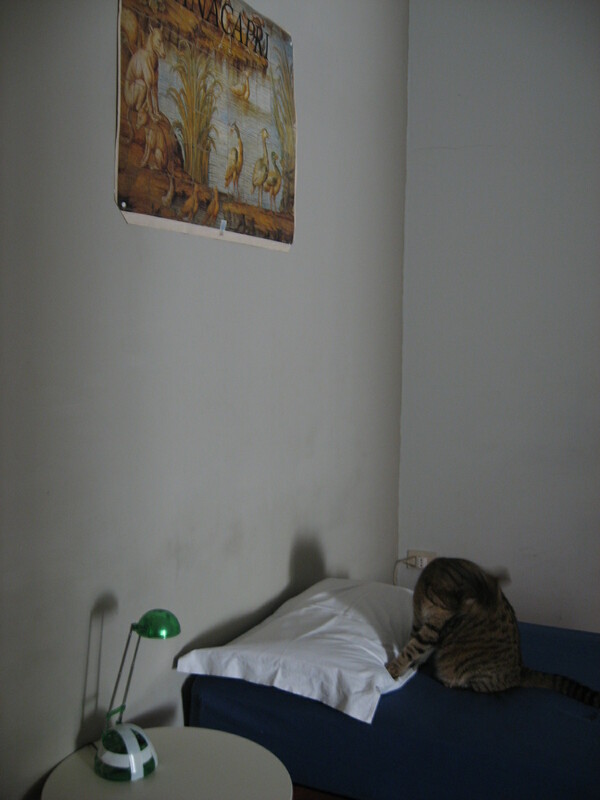 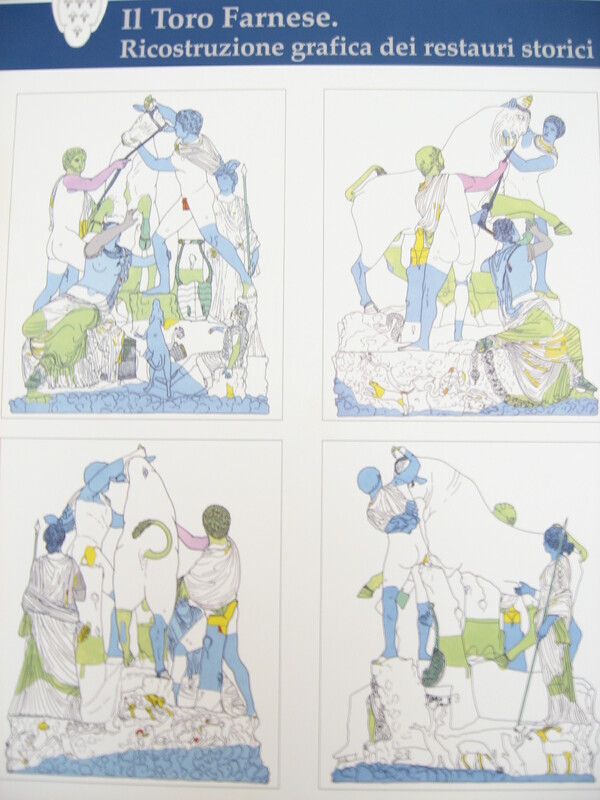 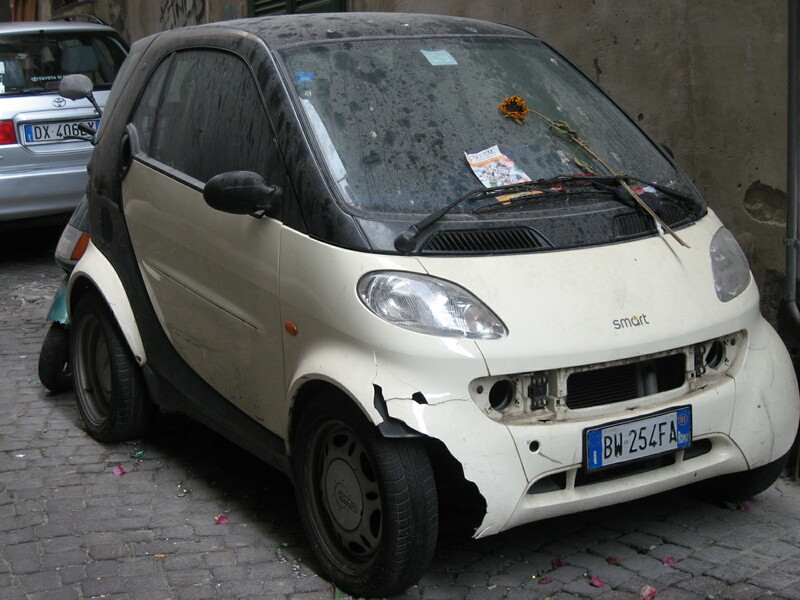 I arrived in Rome Friday morning ready to paint. No sooner than I had settled was I informed that weekends were free to travel. 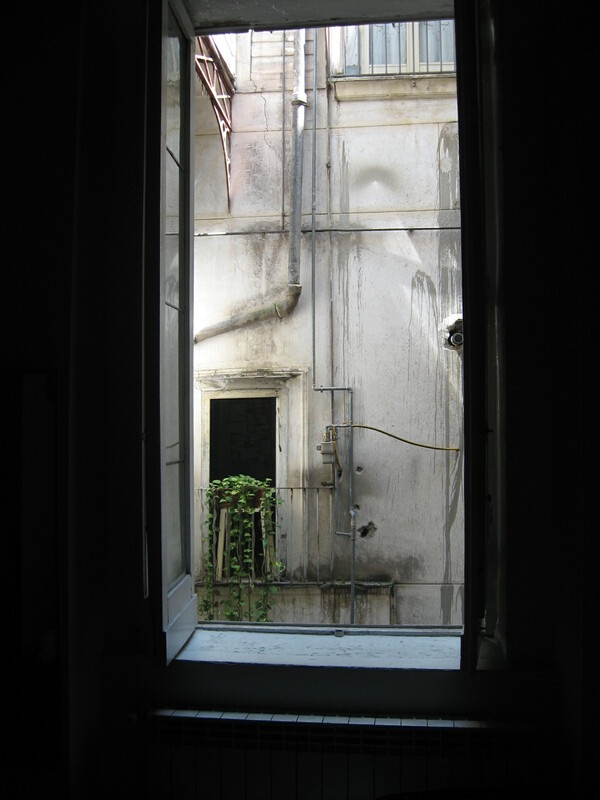 So much for painting in Rome! 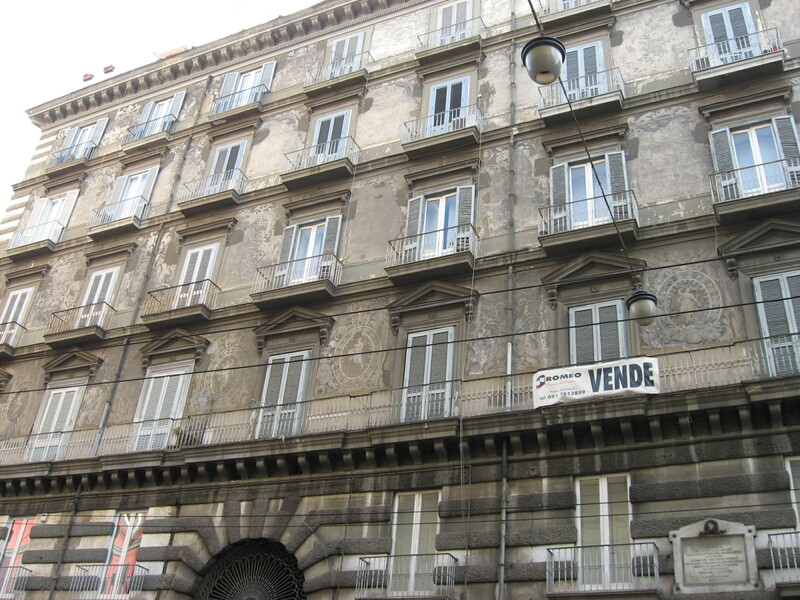 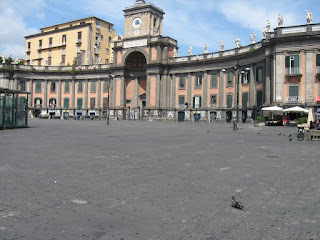 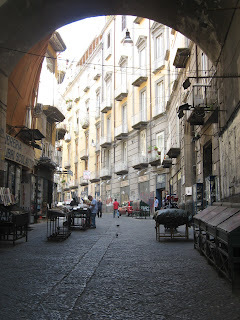 I booked myself a trip to Naples, one of my favorite cities in Italy. 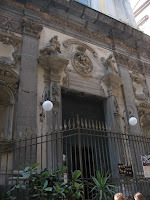 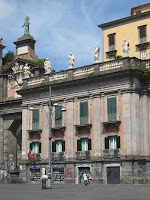 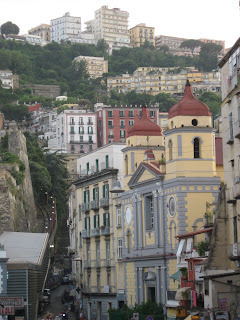 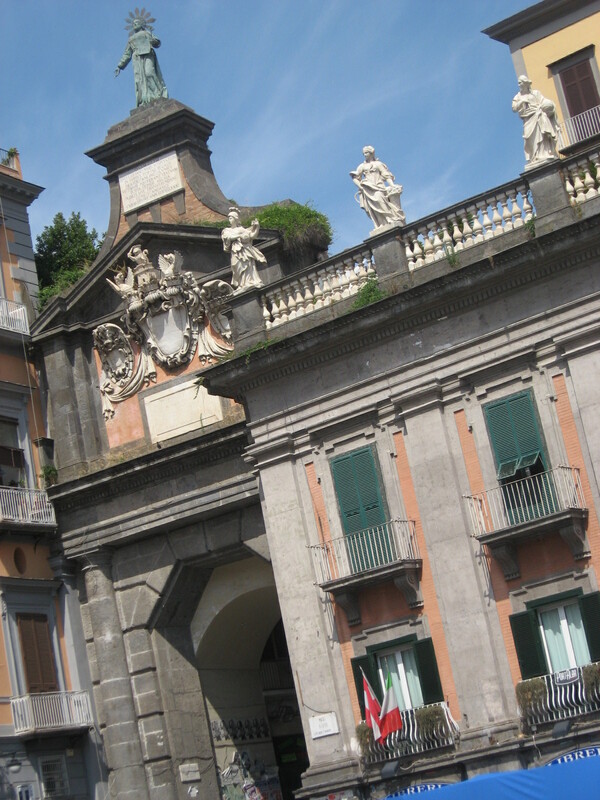 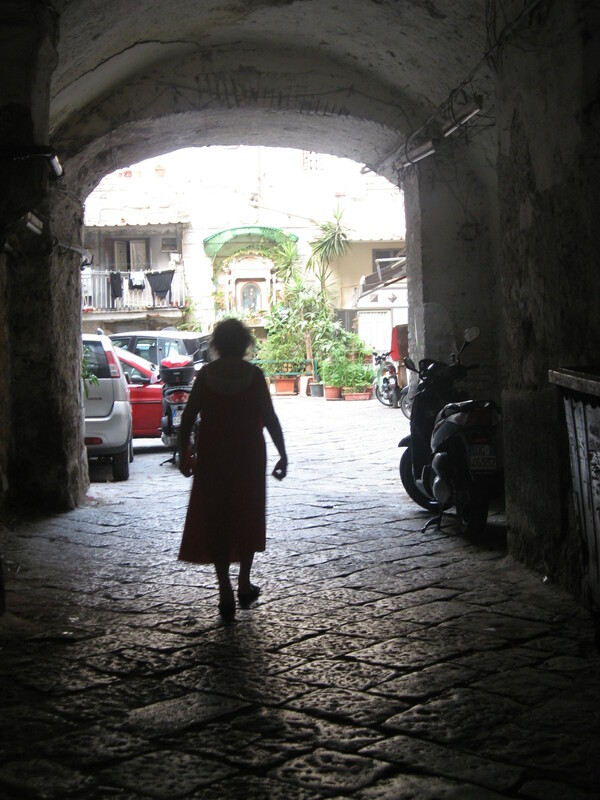 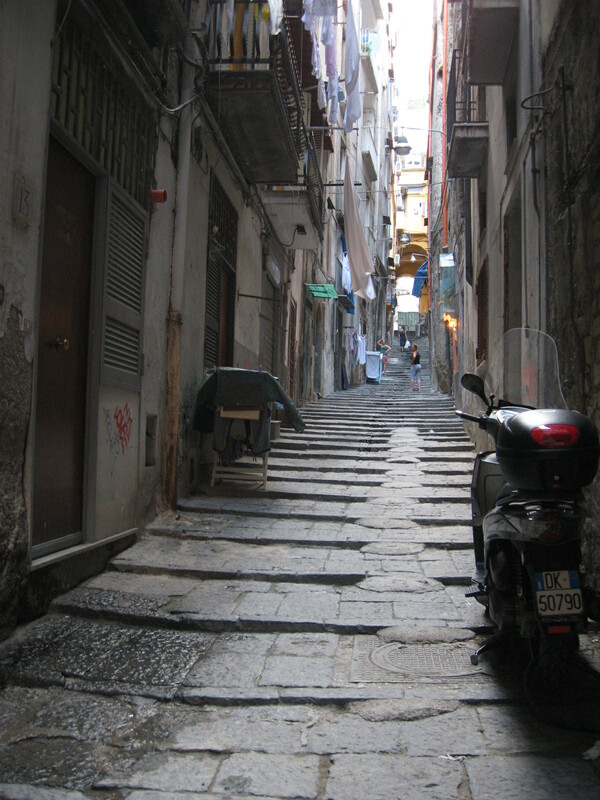 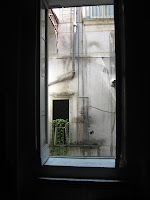 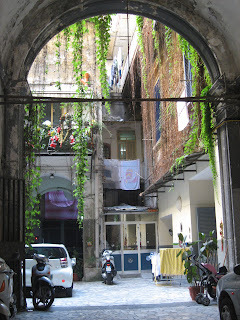 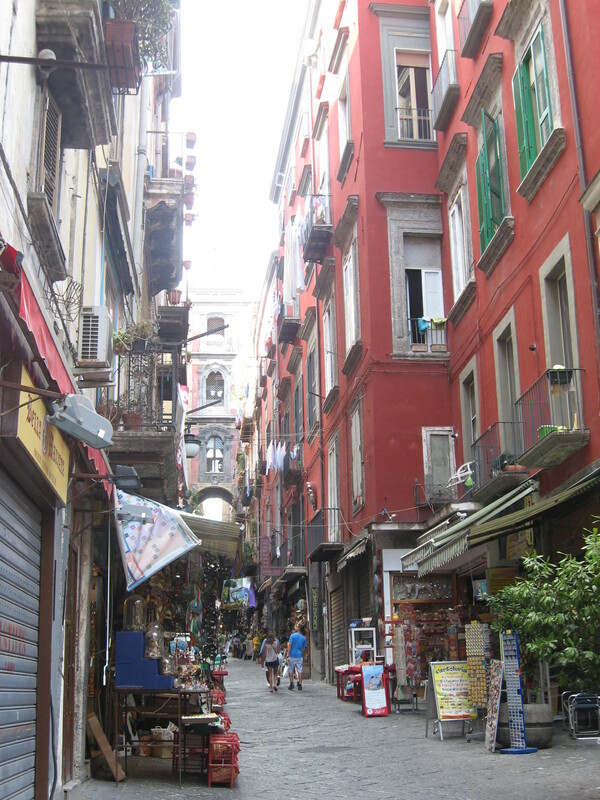 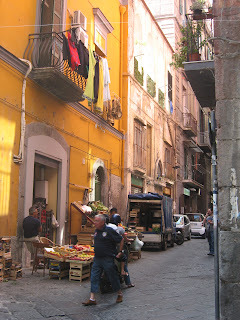 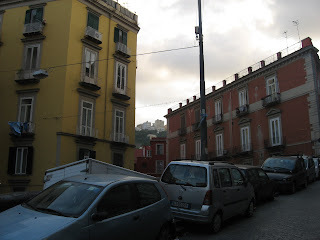 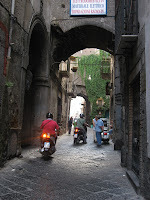 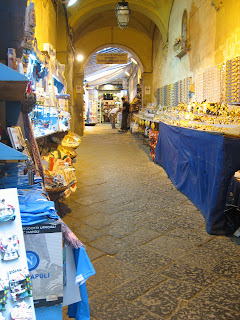 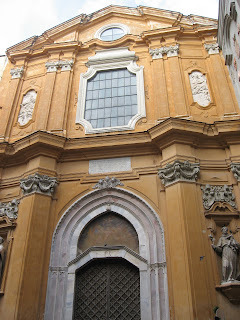 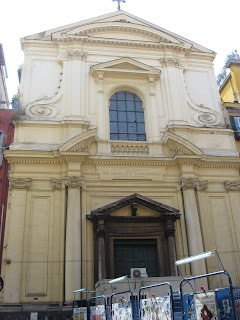 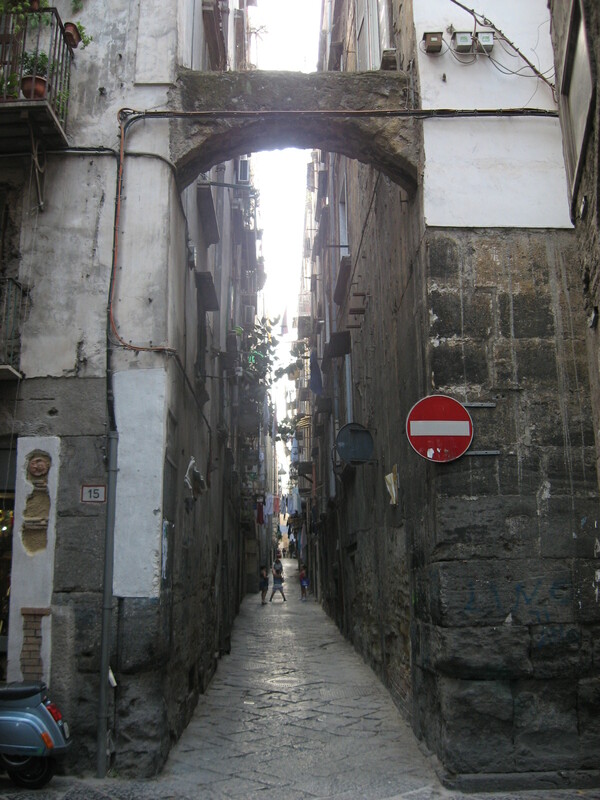 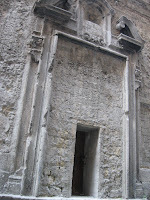 It is always enjoyable to walk around the narrow streets, which occasionally open to grand vistas of the Bay of Naples. 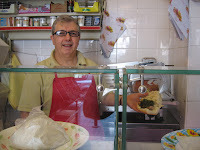 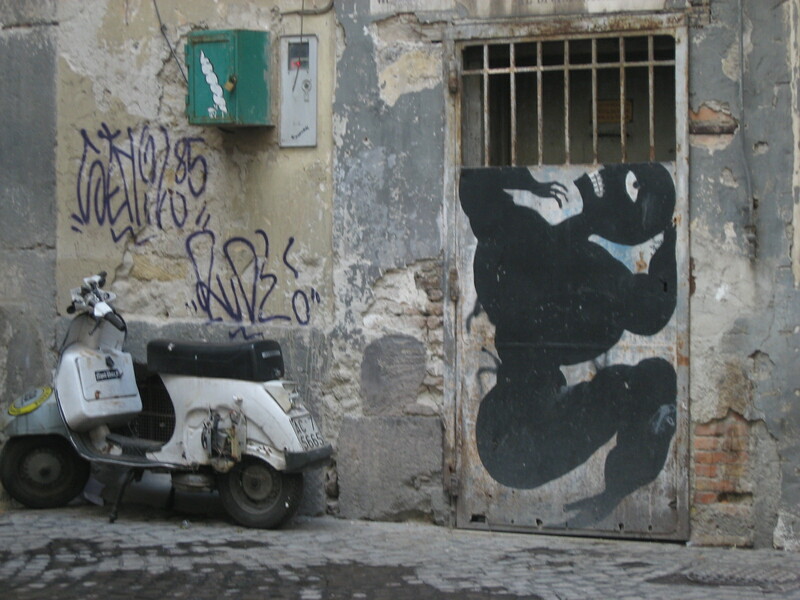 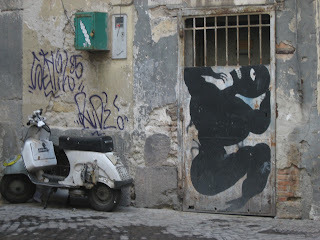 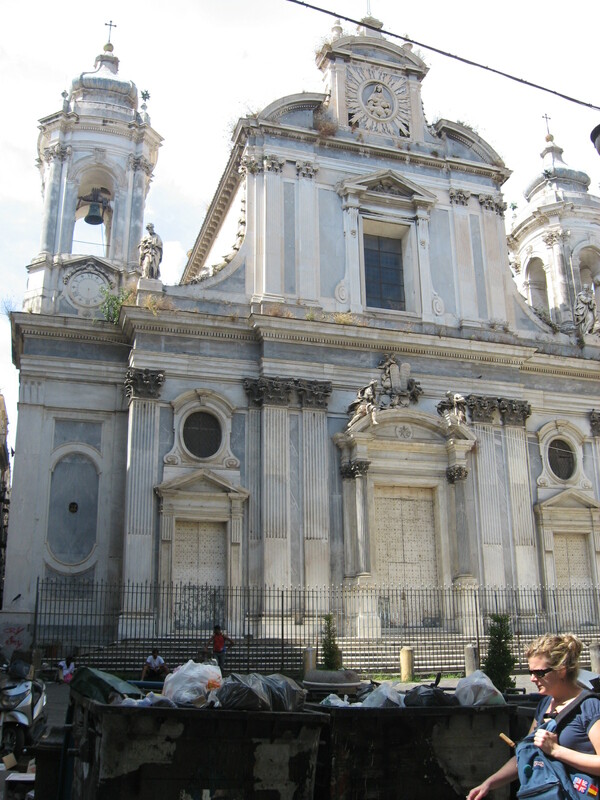 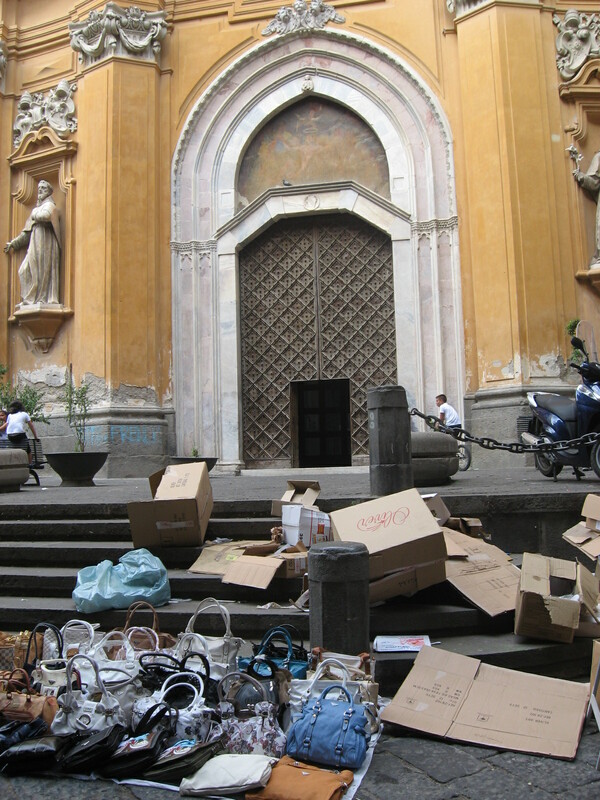 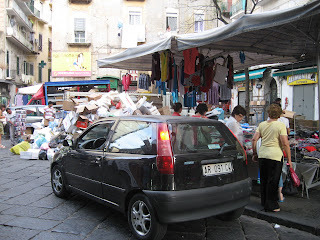 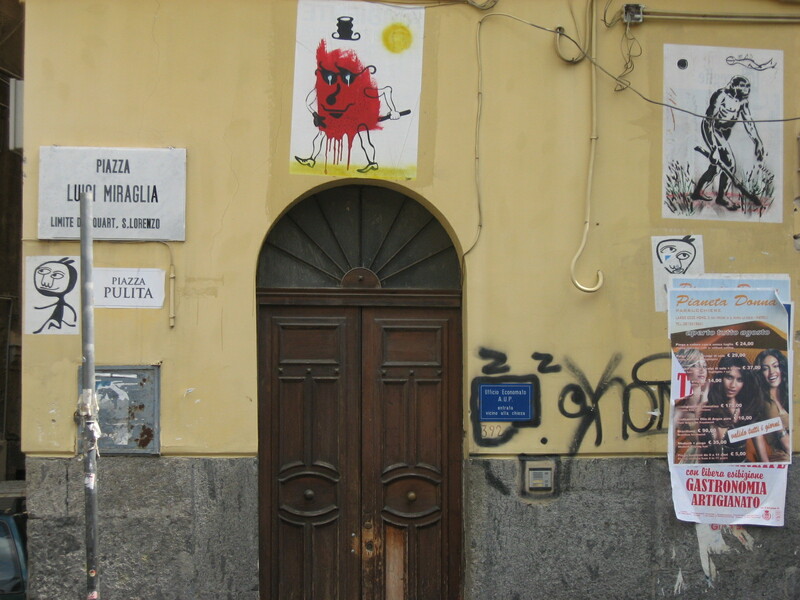 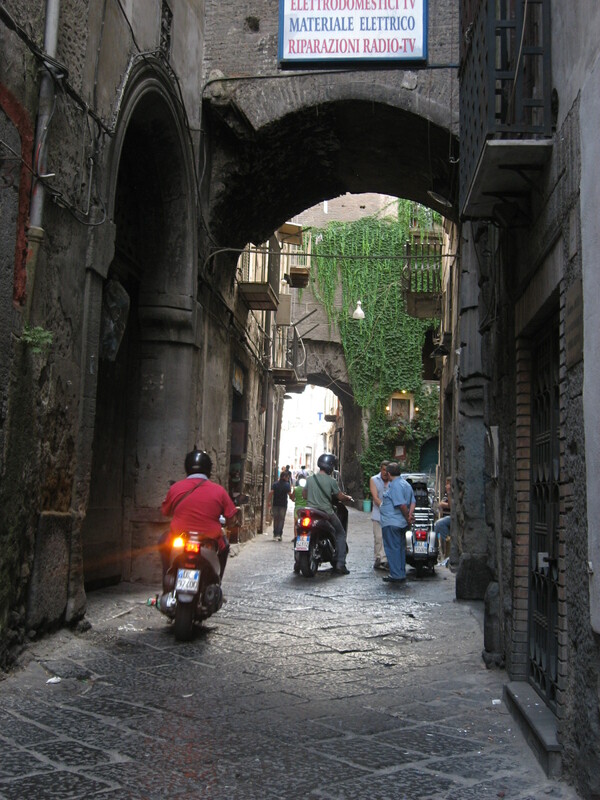 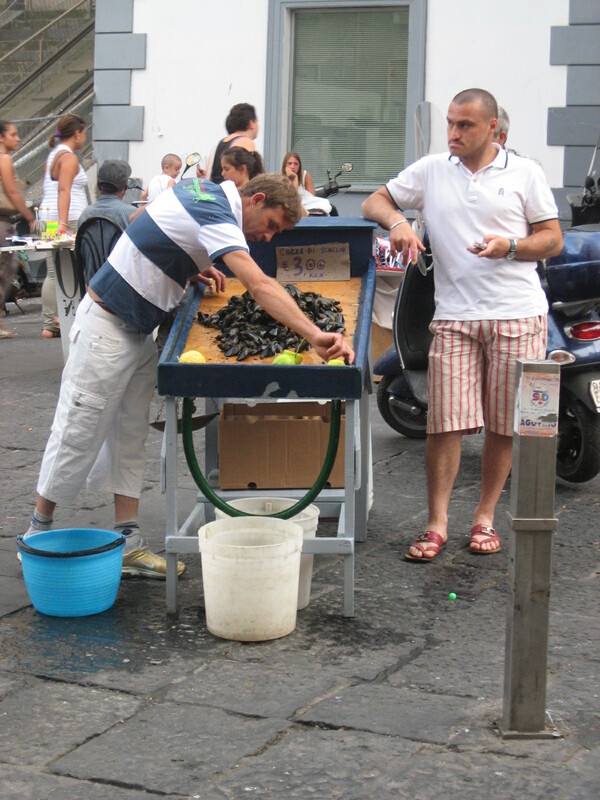 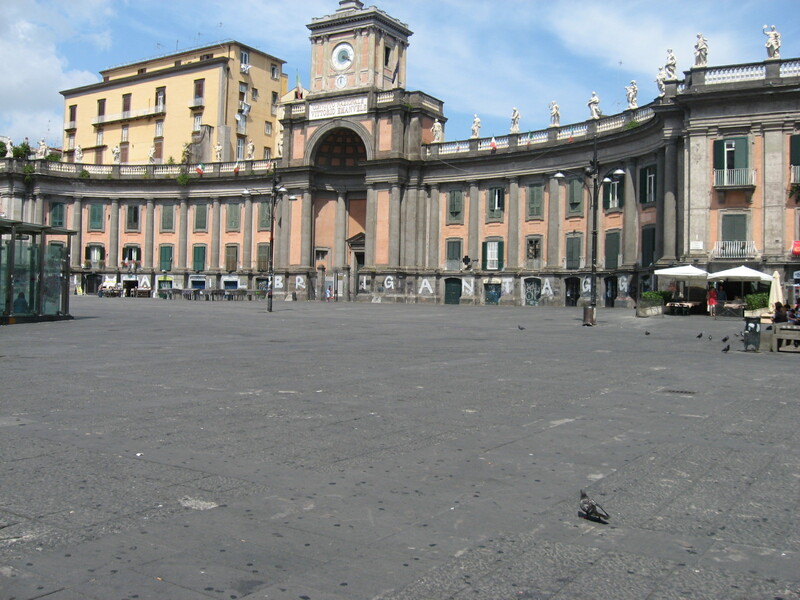 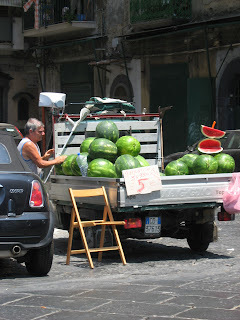 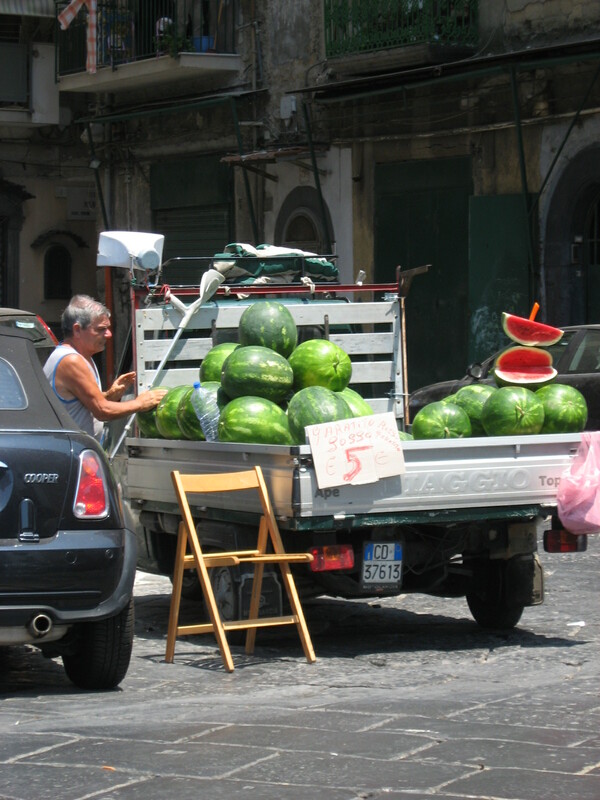 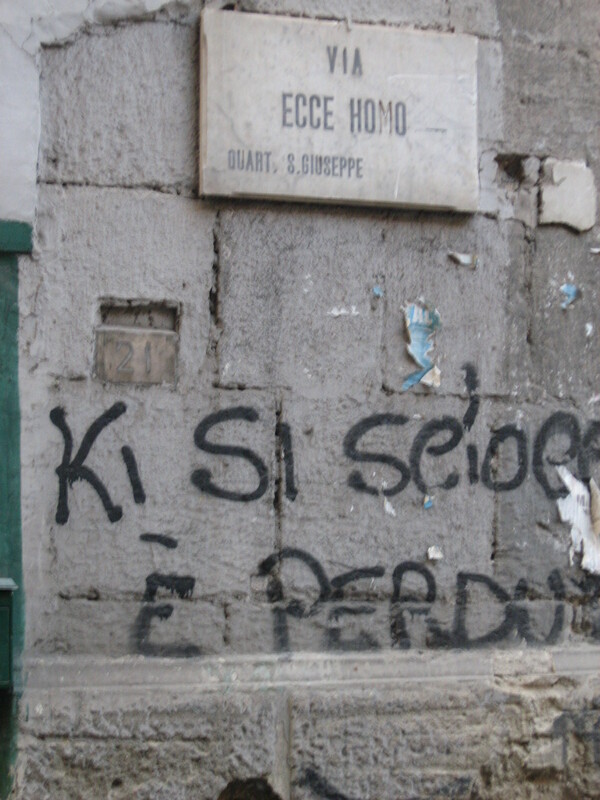 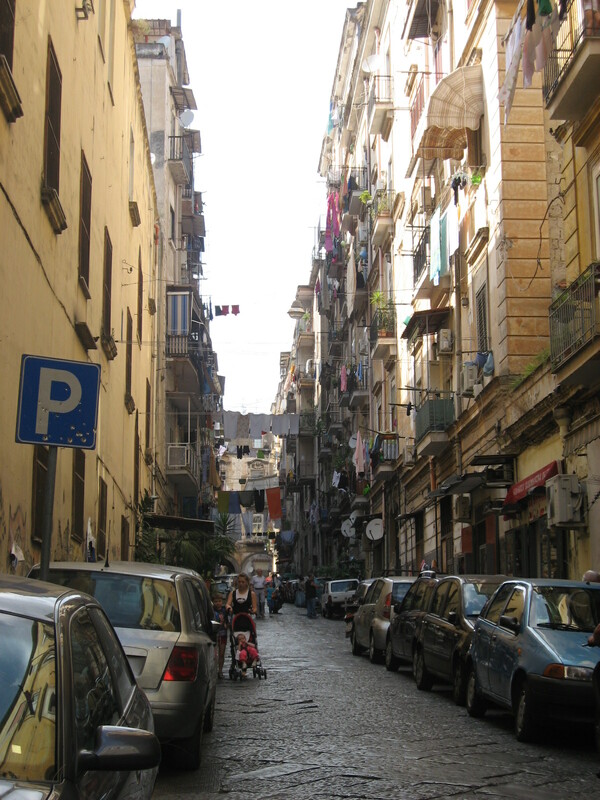 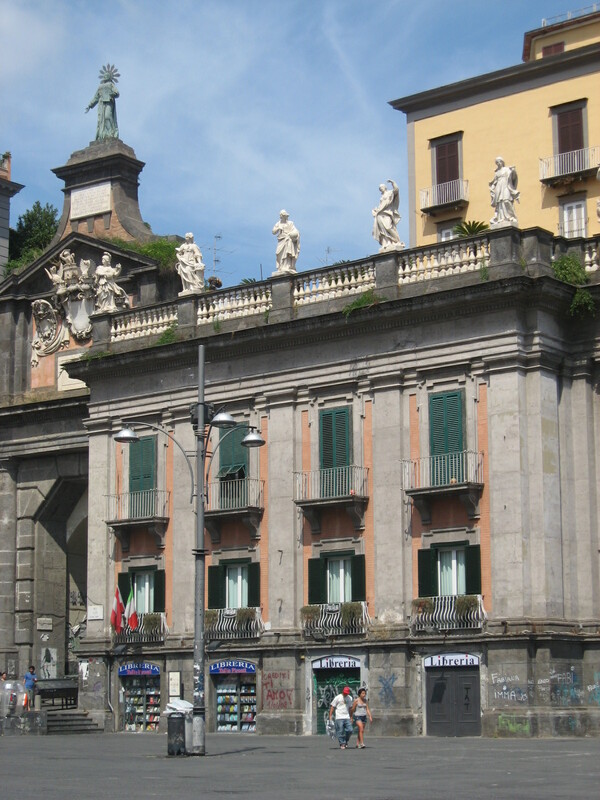 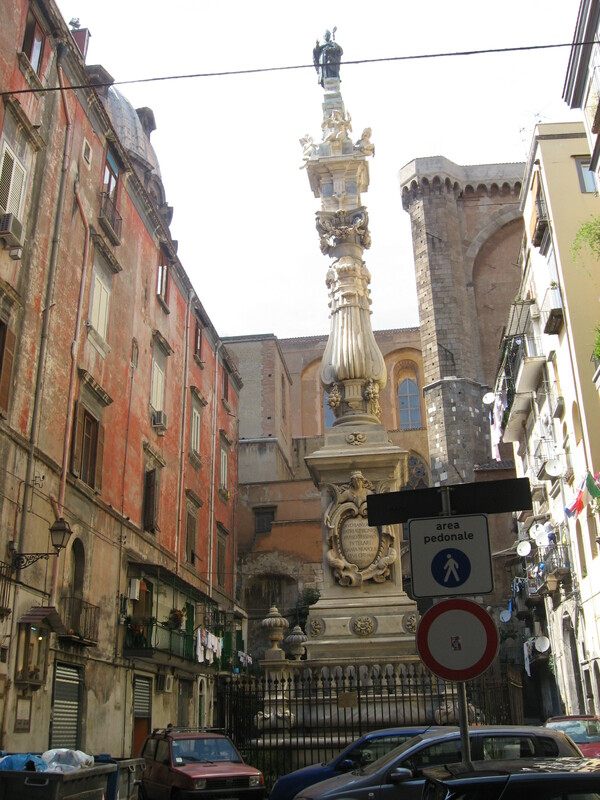 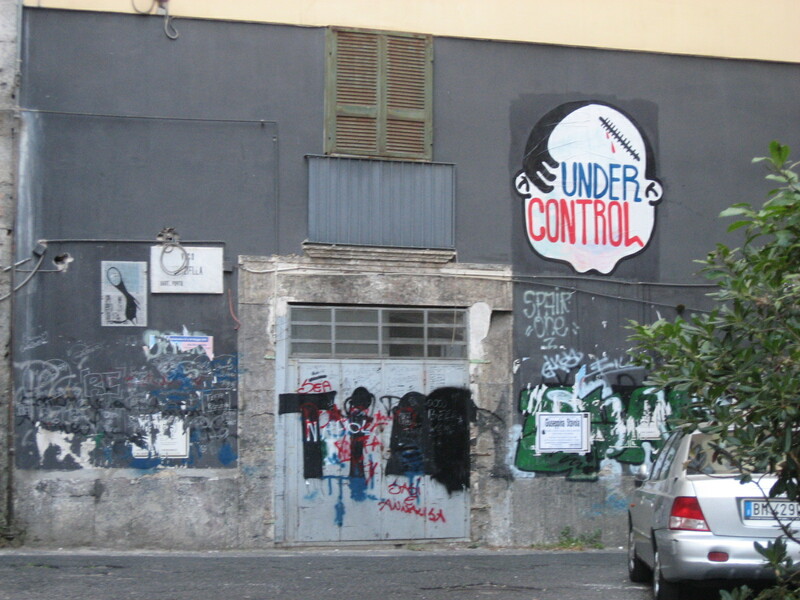 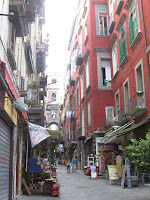 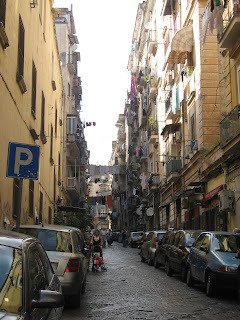 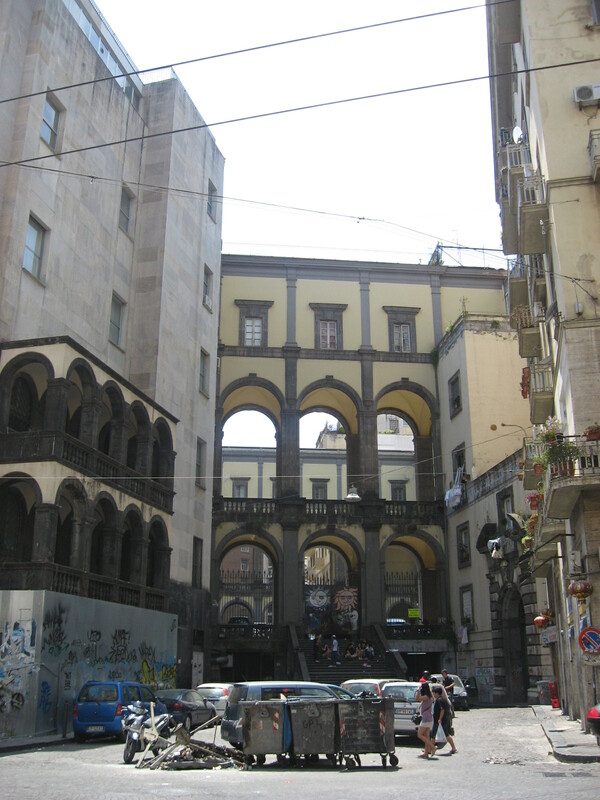 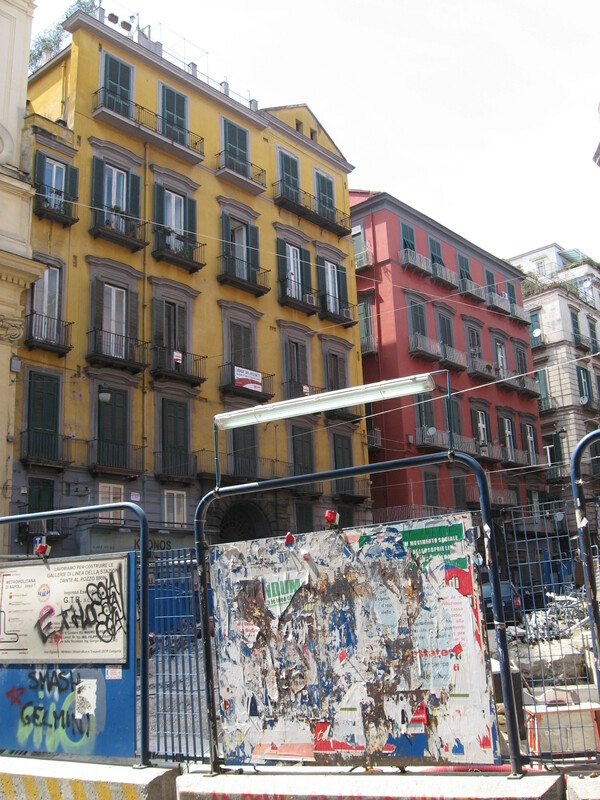 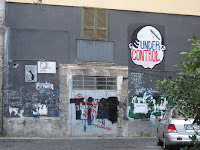 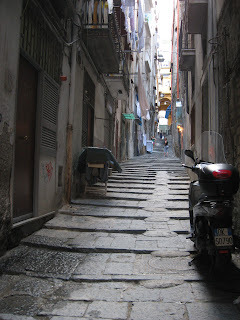 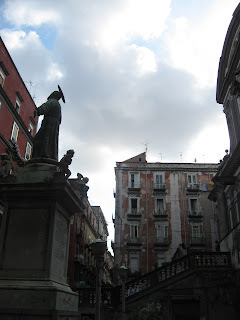 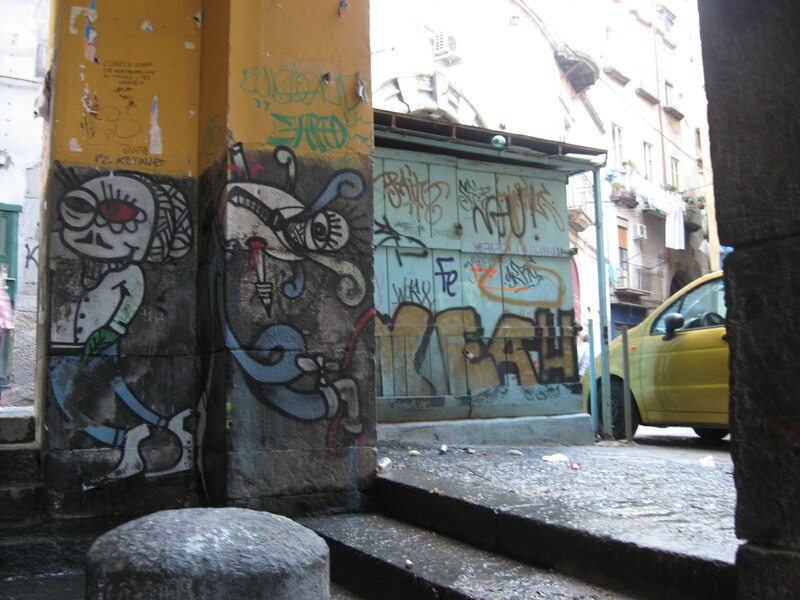 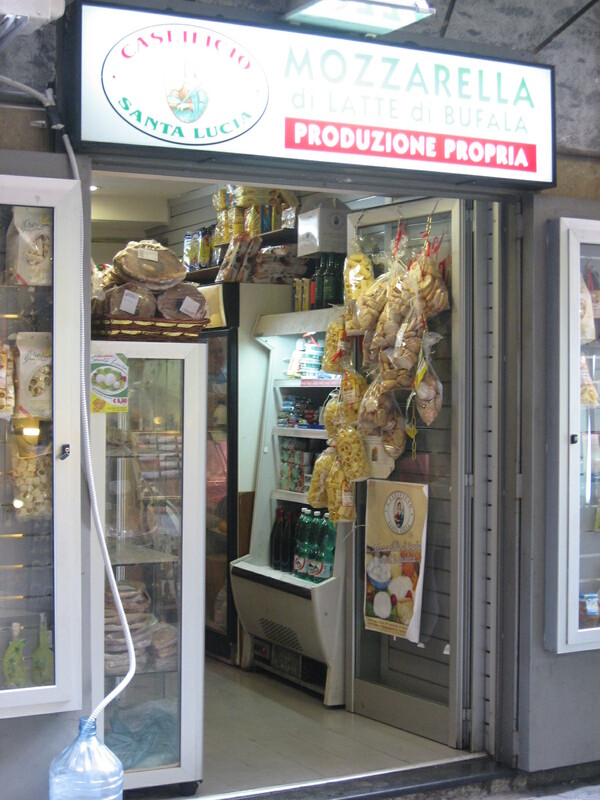 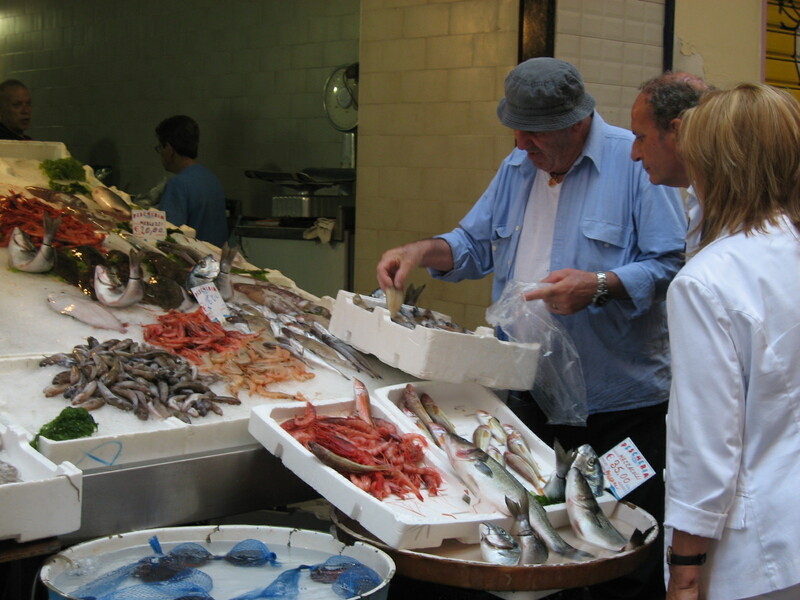 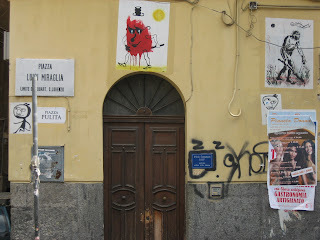 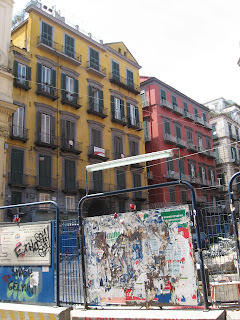 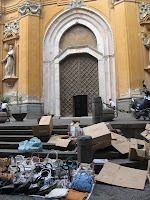 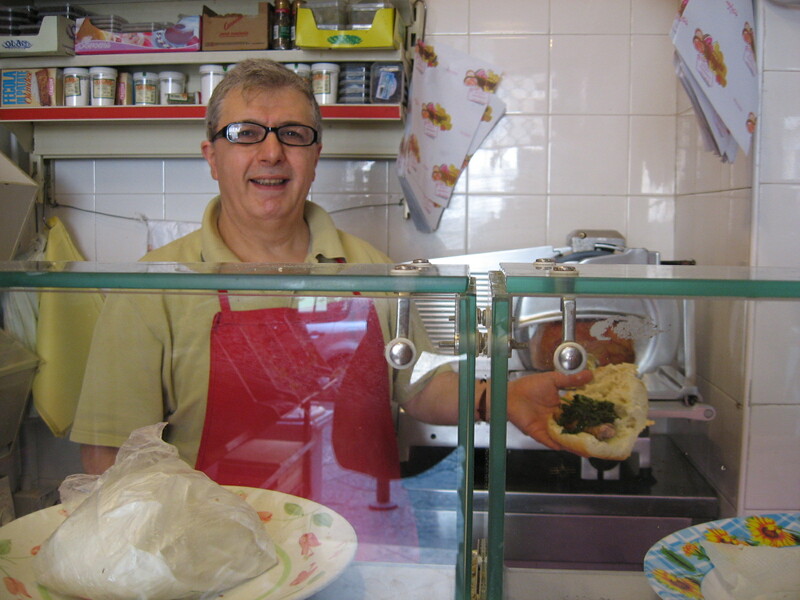 The street vendors, the graffiti, the piles of discarded cardboard and old vegetables, the wonderful food and the people's helpfulness to a lost traveler (scusi...non posso trovare questa strada)...makes Naples a great visit. 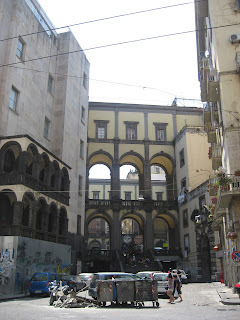 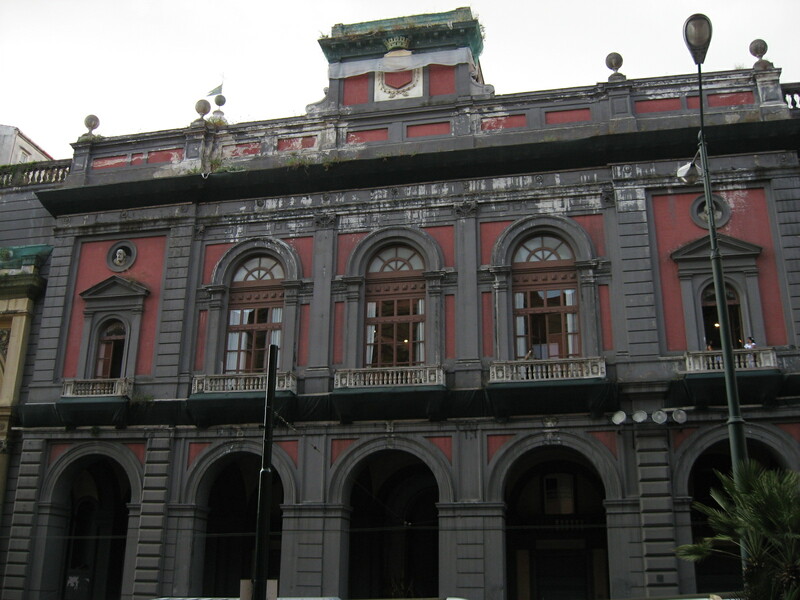 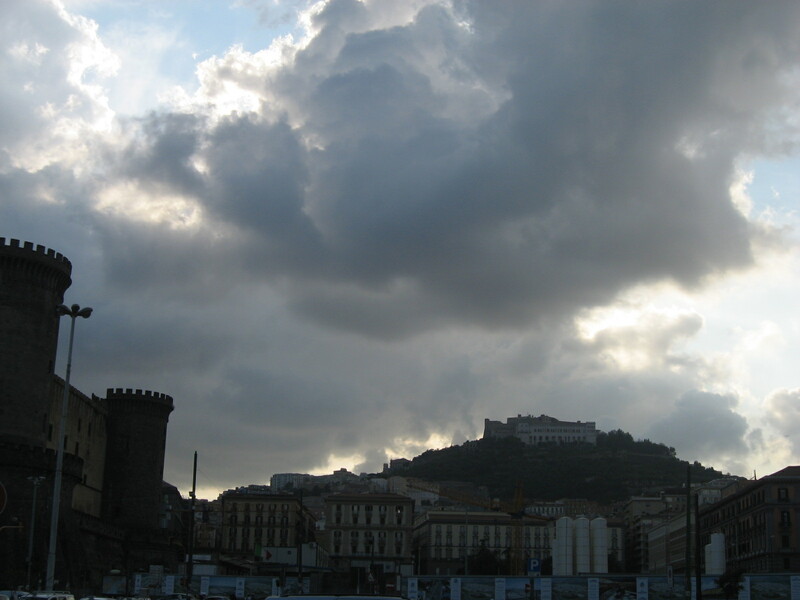 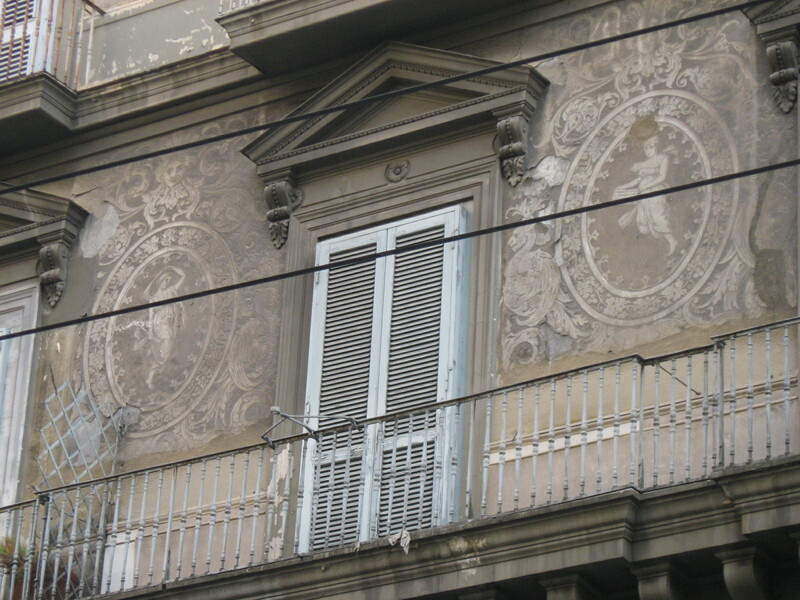 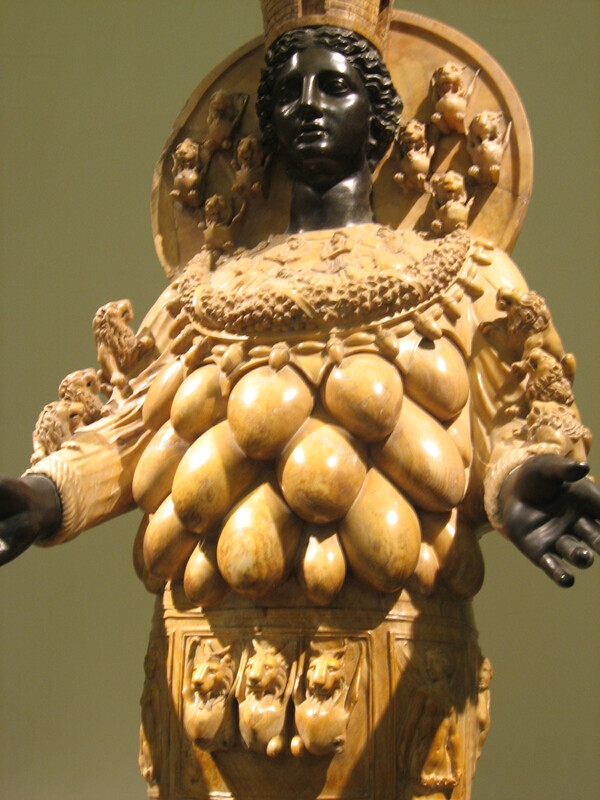 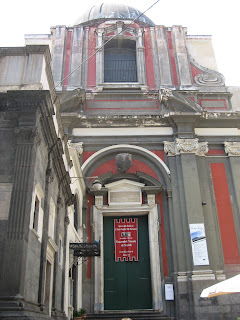 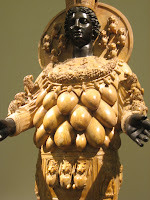 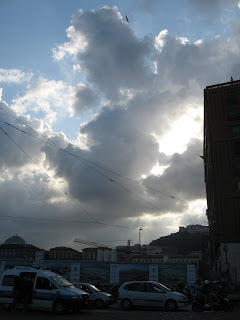 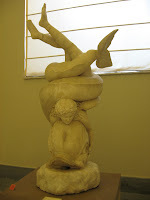 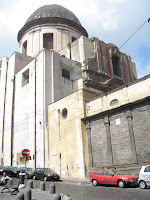 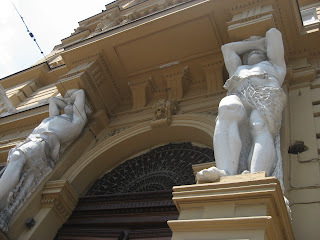 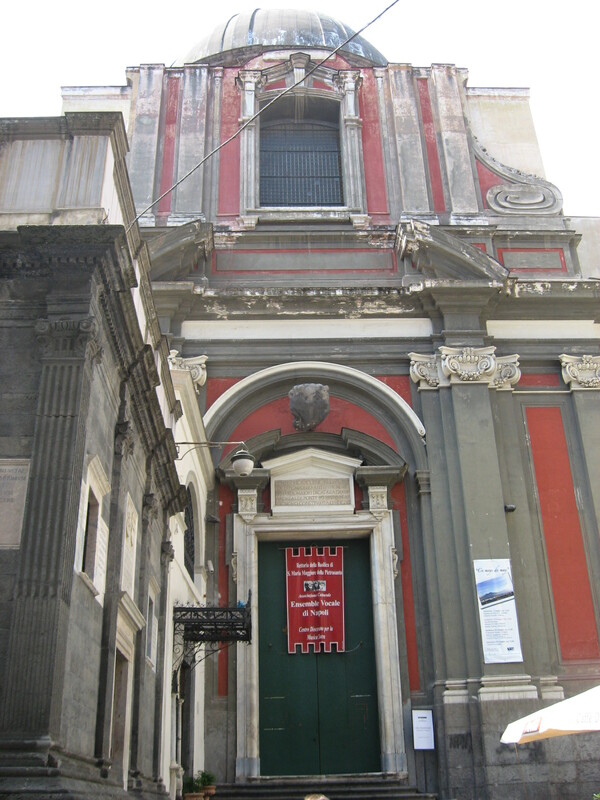 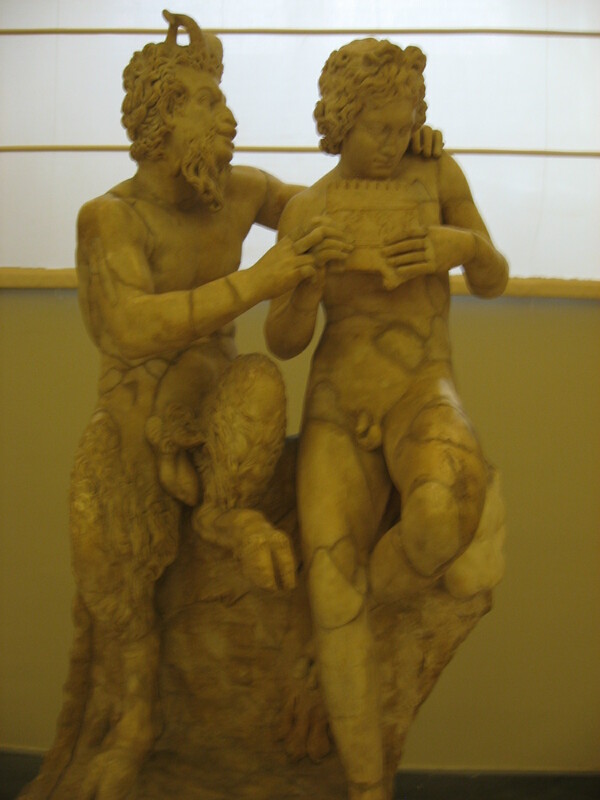 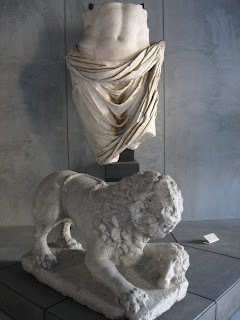 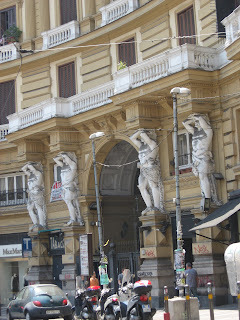 If I had more time, I would have made it to the Museo Nazionale di San Martino (which has great works), Napoli Sotterranea (Naples underground), and perhaps a few wild boat trips from the pier. then I recalled who told that to me, and smiled. 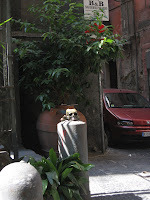 Used condom outside of my hostel!! 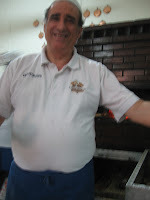 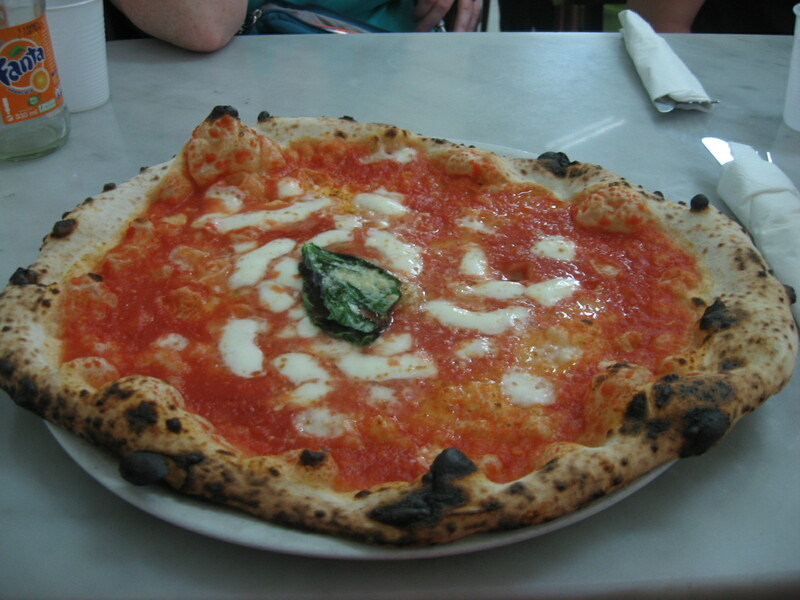 The best pizza in the world? 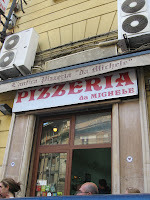 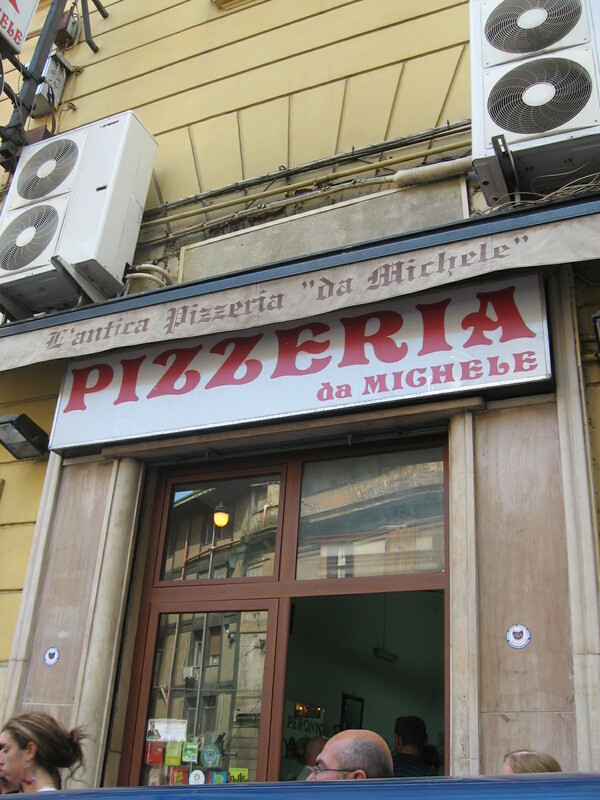 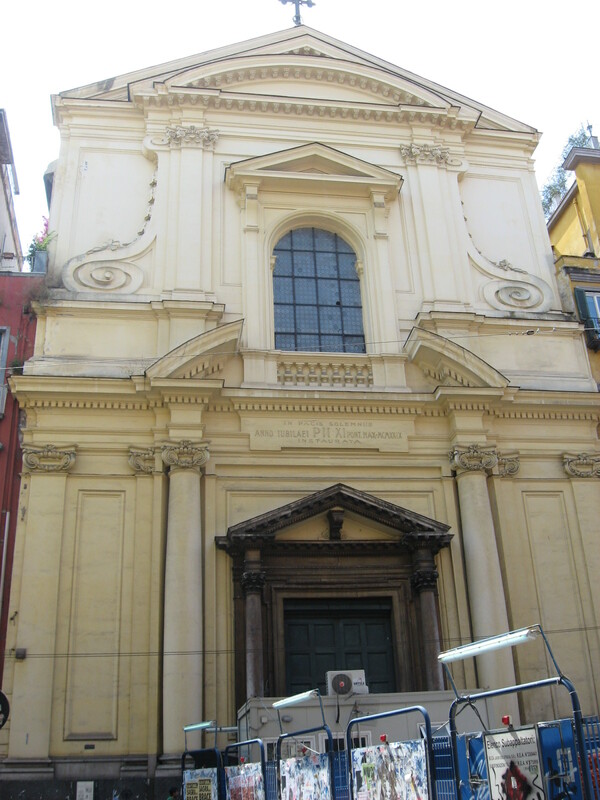 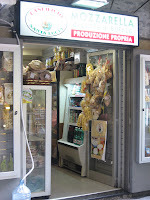 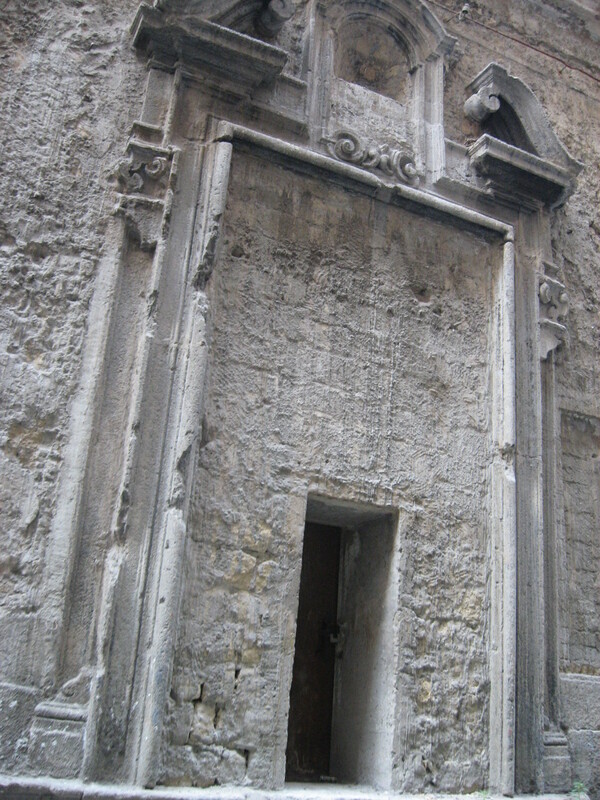 Da Michele, which had a line at 4pm. 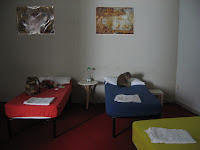 Julia Roberts posters all over the walls. 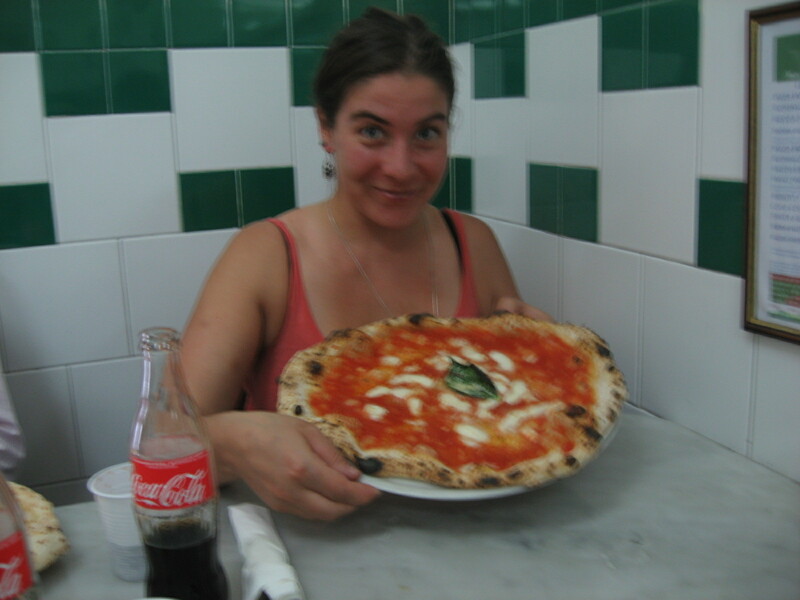 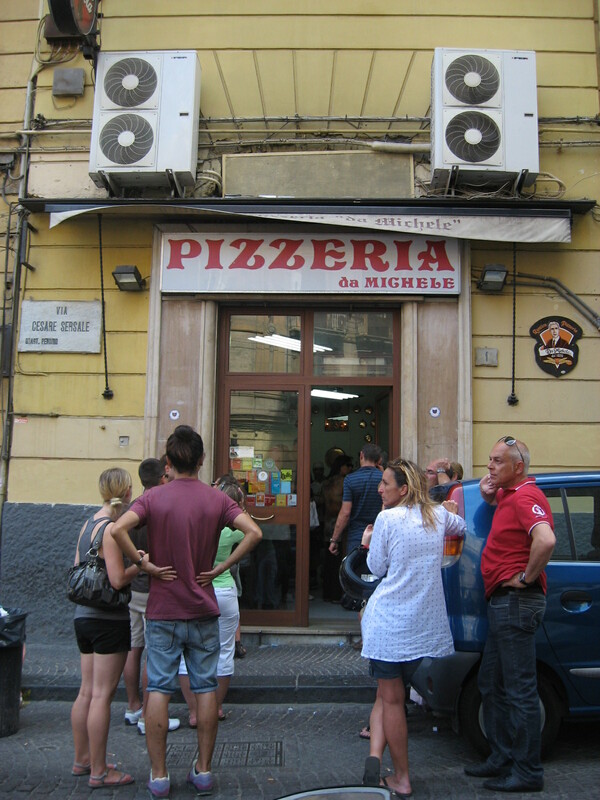 She ate here while filming "Mangia, Prega, Ama"! 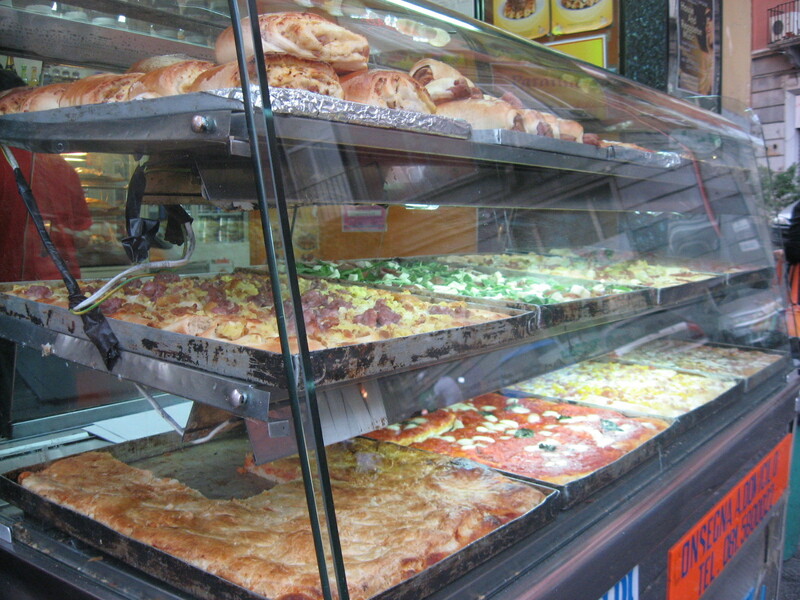 don't think too much, just order. 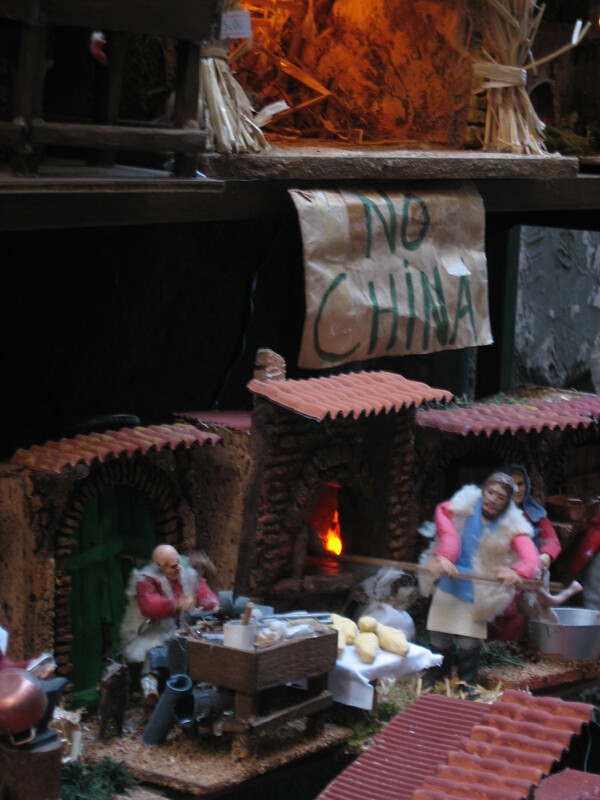 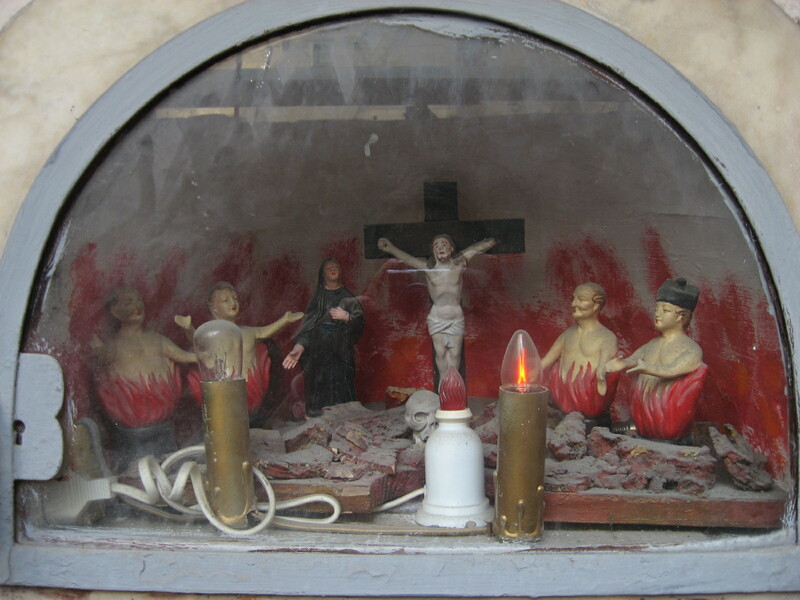 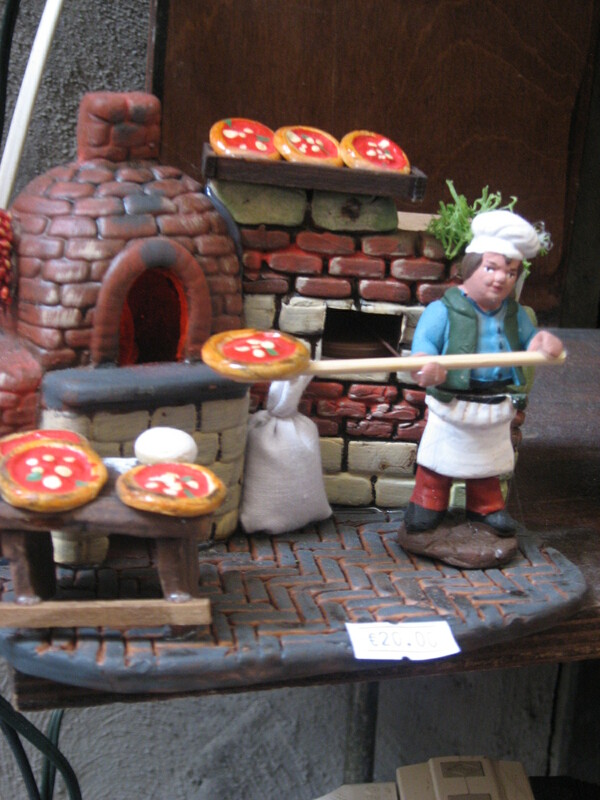 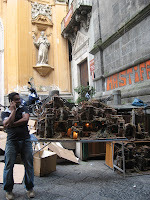 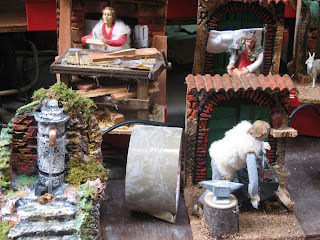 Via San Gregorio Armeno: Buy the best nativity scenes all year round!